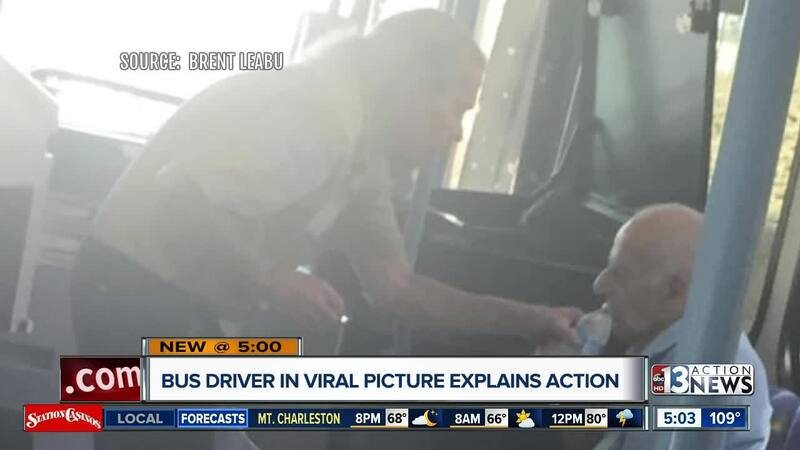 For the first time we are hearing from the bus driver seen in a viral act of kindness photo that has been spreading on social media. The photo was posted by Brent Leabu in a subreddit titled "HumansBeingBros." He said that it happened on Monday on Bus 201 near Jones Boulevard and Tropicana Avenue. Leabu says that the bus driver took the water from his own lunch cooler. Mike Blair has been driving a bus for 5 years and on Monday he noticed something he had not come across before. "This one gentleman, he didn't board and he seemed like he started to kind of grasp the wall there," explained Blair. Like all bus drivers for Keolis, the bus operator company in Las Vegas, Blair had received training on how to recognize and respond to heat-related illnesses. "I got over there, closer to him, and you could see he was overheated," said Blair. 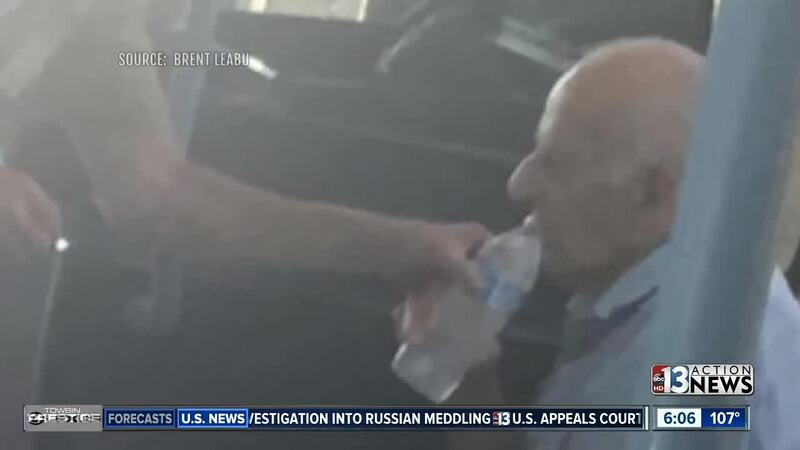 The blazing sun had pushed temperatures close to 110 degrees and the 92-year-old man was showing signs of heat exhaustion. "Outside it was 107 degrees, [the man] was sitting on a concrete wall with the radiation it was probably closer to 120 degrees," said Julien Francis, General Manager for Las Vegas Keolis. Blair positioned the man under an air conditioning vent on board the bus and quickly retrieved a bottle of water from his own lunchbox. Blair says the man cooled down and only spent 10 minutes on board the bus. The man told Blair he was headed to the Orleans to meet some friends. Blair said he did not recognize the man as a regular on his route. For Blair's act of kindness caught on camera, Keolis threw him a party. The general manager for Keolis says during hot temperatures drivers are giving hourly reminders to watch for passengers showing heat-related illness symptoms. Each year the company buys thousands of water bottles for drivers and passengers. Although Las Vegas is no longer under an excessive heat warning, it is still very hot in the valley. Monday's high temperature was recorded as 104 degrees with some areas of the valley being hotter and some areas being a couple of degrees cooler. Earlier this month, the Regional Transportation Commission was handing out free bottled water at various Las Vegas bus stops. And they have done the same in previous years when it has been unusually hot.